Panelists Samina Hussain, Galya Ruffer and Corrie Wallace talk to a group of about 50 attendees about diversity and inclusion in Chicago’s northern suburbs. Grassroots group Open Communities hosted the annual meeting. An organization that focuses on affordable housing in Chicago’s northern suburbs held a meeting Sunday to discuss diversity and inclusion in the community. 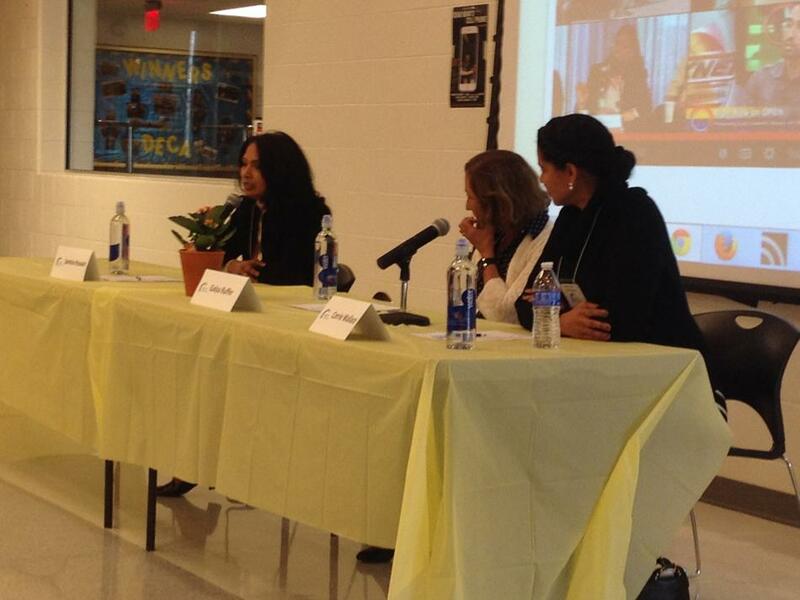 Evanston resident Mary Trujillo moderated Open Communities’ annual meeting at Niles West High School in Skokie. During the meeting, she quoted the civil rights activist Martin Luther King Jr., who spoke in Winnetka about 50 years ago. King made a speech in a Winnetka park, said Open Communities executive director Gail Schechter. Open Communities used the anniversary as a way to open up discussion about diversity and inclusion in the North Shore community. During the 1960s, community residents organized the North Shore Summer Project to try to show discrimination in real estate throughout the area. Evanston resident Nina Raskin served as the freedom coordinator at the time. The goal of the group was to make it possible for black residents to buy housing and live in integrated neighborhoods, she said. The event Sunday brought out about 50 North Shore residents, including Wilmette resident Gerald Smith. Smith, director of minority affairs at the College of Engineering at the University of Illinois at Chicago, told The Daily he appreciated the openness of discussion. It’s good to see that grassroots-level movements still exist today, said Smith, who has lived in the area for more than 20 years. The panelists discussed the meaning of diversity and its presence in a community on a socioeconomic level. The Open Communities diversity discussion served to lay the groundwork for the organization’s 2015 Justice Project: The March Continues, an initiative to make communities more welcoming through research and reflection. Samina Hussain, another panelist, told the audience about her reasoning behind moving to Morton Grove, Illinois, from Lincolnwood, Illinois, where she grew up. She said diversity was one of her main concerns when deciding where to raise her family. She also said she wants to see a more diverse teaching staff throughout the area, especially at the elementary school level. The third panelist and political science Prof. Galya Ruffer grew up in Skokie with Israeli parents. She spoke Hebrew and, despite speaking fluent English, felt she was defined as the girl from Israel, she said. When she moved to Highland Park, Illinois, she said she felt for the first time that she was included in the community.